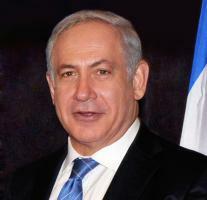 See the gallery for quotes by Benjamin Netanyahu. You can to use those 8 images of quotes as a desktop wallpapers. I'm not consumed with political machinations. I'm the prime minister who removed 400 checkpoints, barriers, road-blocks and so on to facilitate the growth of the Palestinian economy. I've been right more than I've been wrong. Israel has always been pro-American. 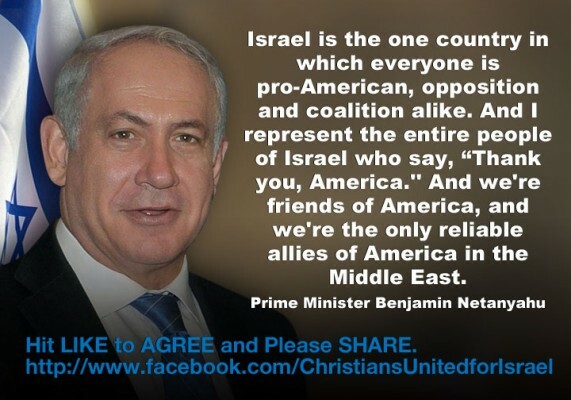 Israel will always be pro-American. Israel is so tiny. It's, you know, a little less than the length of Manhattan, without the West Bank, without Judea and Samaria. Israel produces more conceptual products than any other country. The application of military force, or the prospect of such application, inhibits terrorist violence. The Obama presidency has two great missions: fixing the economy, and preventing Iran from gaining nuclear weapons. The State of Israel can be proud of what we're doing. 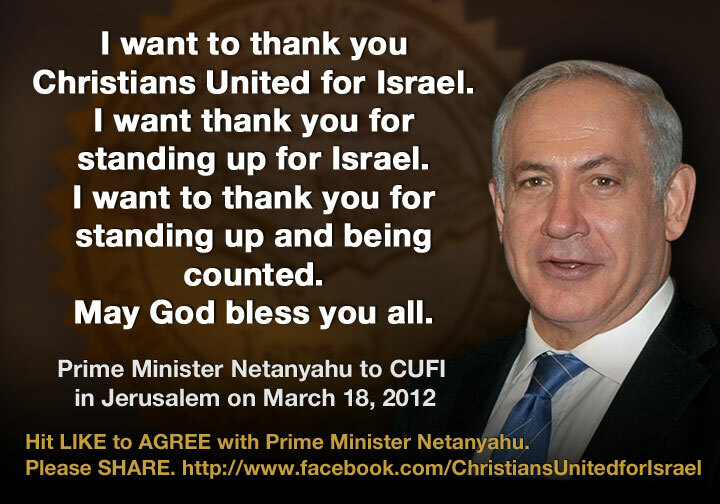 There's no one in Israel who appreciates more than me the importance of American support for Israel. You know, I'm just not going to get into American politics. But so far, you know who's been violating the nuclear nonproliferation pact day and night? Those who signed it. 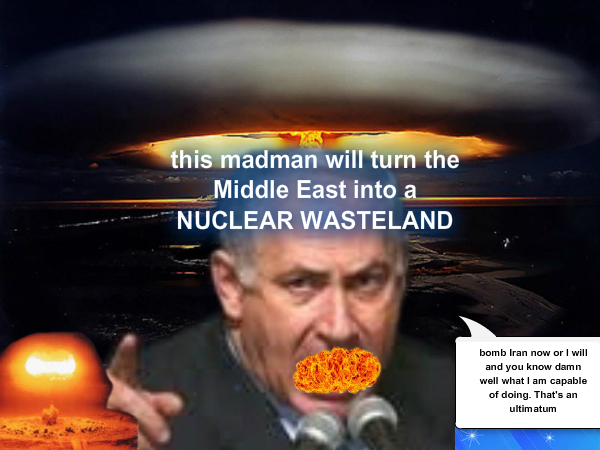 Iran, Iraq, Libya and Iran violates it while calling for Israel's destruction and racing to develop atomic weapons to that end. 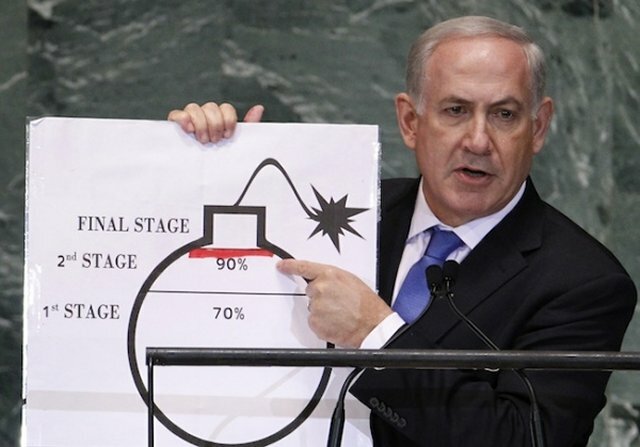 I can tell you one thing, Iran is closer to developing nuclear weapons today than it was a week ago, or a month ago or a year ago. It's just moving on with its efforts. I don't think you can rely on Iran. I don't think you can rely on other radicals like the Taliban. They dispatched Al Qaida to bomb New York and Washington. What were they thinking? Were they that stupid? They weren't stupid. There is an irrationality there, and there is madness in this method. I say that to my colleagues, by the way, in the internal Cabinet meetings, I say, 'Look, I want to be very clear about what I want.' I just - I don't want a peace process, I want a peace result. Most of the approaches to peace between Israel and the Palestinians, have been directed at trying to resolve the most complex problems, like refugees and Jerusalem, which is akin to building the pyramid from the top down. 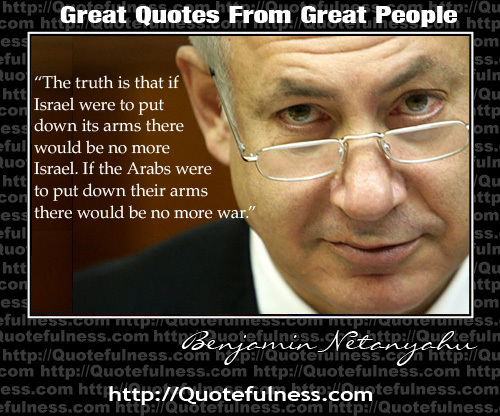 Much more quotes by Benjamin Netanyahu below the page. Well, this is an unfortunate part of the UN institution. It's the - the theater of the absurd. It doesn't only cast Israel as the villain; it often casts real villains in leading roles: Gadhafi's Libya chaired the UN Commission on Human Rights; Saddam's Iraq headed the UN Committee on Disarmament. Why are we talking about talking? Why negotiating about negotiating? It's very simple. If you want to get to peace, put all your preconditions on the side, sit down opposite a table, not in a studio, by the way. You know, I think, I think the Palestinians are trying to get away without negotiating. They're trying to get a state to continue the conflict with Israel rather than to end it. They're trying to basically detour around peace negotiations by going to the U.N. and have the automatic majority in the U.N. General Assembly give them, give them a state. And by the way, a piece of news, Israel is the one country in which everyone is pro-American, opposition and coalition alike. And I represent the entire people of Israel who say, 'Thank you, America.'' And we're friends of America, and we're the only reliable allies of America in the Middle East. I often hear them accuse Israel of Judaizing Jerusalem. That's like accusing America of Americanizing Washington, or the British of Anglicizing London. You know why we're called 'Jews'? Because we come from Judea. I don't think Israel can accept an Iranian terror base next to its major cities any more than the United States could accept an al Qaeda base next to New York City. Hezbollah-controlled Lebanon now presides over the UN Security Council. This means, in effect, that a terror organization presides over the body entrusted with guaranteeing the world's security. You couldn't make this thing up. Some will criticize me no matter what I do. I think that peace will require two states, a Palestinian state that recognizes the Jewish state. Those in the international community that refuse to put red lines before Iran don't have a moral right to place a red light before Israel. If we accept the notion that terrorists will have immunity because as they fire on civilians they hide behind civilians, then this tactic will be legitimized and the terrorists will have their greatest victory. The right combination is between a free economy and social policy that addresses the needs of society and creates equal opportunity. You don't have people chanting 'Death to America' in Israel. As far as a nuclear weapons-free zone, you know, when the lion lies down with the lamb, and you don't need a new lamb every day to satisfy the lion, then we might have this kind of transformation in the Middle East. I don't want to govern the Palestinians. I don't want them as subjects of Israel or as citizens of Israel. I want them to have their own independent state but a demilitarized state. President Abbas, you've dedicated your life to advancing the Palestinian cause. Must this conflict continue for generations, or will we enable our children and our grandchildren to speak in years ahead of how we found a way to end it? That's what we should aim for, and that's what I believe we can achieve. 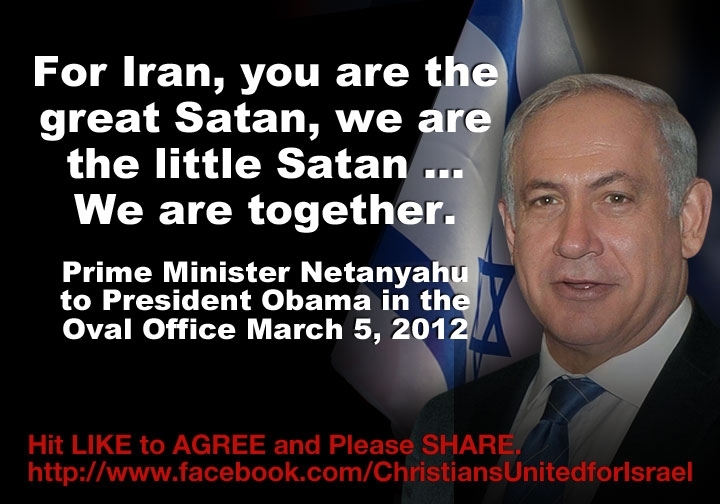 I will say that I think Israel enjoys strong bipartisan support in the United States. It's really above and beyond American politics.